Been wanting to try one of the many walking tours of Manila but never had the time or budget for it? Here’s your chance to join one for free! Join the JustWandering 4th year anniversary contest and get a chance to win a Binondo Food Wok Tour with Ivan ManDy! To join, just “like” the JustWandering page on Facebook. Once you’re a member, you have to answer this simple question: When did I join Ivan ManDy’s Big Binondo Food Wok Tour? Once you found the answer (it’s in my blog!) post it on the page’s wall. Only members with the correct answer gets included in the raffle draw. You can post several answers, but only the correct answer will count. 1. The contest is open to all Philippine residents. 3. 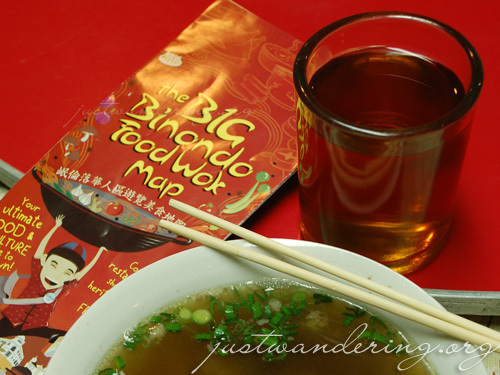 Search JustWandering.org for the answer to this question: When did I join Ivan ManDy’s Big Binondo Food Wok Tour? 4. Post your answer in the Page’s wall. You can post as many answers or guesses, but only the correct answer will be counted towards the raffle. The date can just be the month and year. 5. All the members who posted the correct answer will be included in the raffle. The winner will be picked through Random.org’s List Randomizer. 7. Winner will be announced on May 6, 2010. The winner will be able to join the Big Binondo Food Wok tour with Ivan ManDy of Old Manila Walks. The winner must avail of the free tour within 3 months upon the end of the contest. Huge thanks goes out to Ivan for offering to sponsor my anniversary contest! Old Manila Walks conduct walking tours of different parts of Manila. For tour descriptions and schedule, visit www.oldmanilawalks.com. here’s to more travels and adventures! congratulations on your blog anniversary!